For those of us fortunate enough to come together at Davos this year, the Fourth Industrial Revolution promises gains in scientific knowledge, human health, economic growth and more. But for most people around the world, the prospect of a future in which robots and computers can perform many human jobs is a source of profound personal concern. As president of an institute with ‘technology’ in its name and ‘the betterment of humankind’ in its mission, I take these concerns seriously. Every past technology wave ultimately produced more jobs than it destroyed and delivered important gains, from higher living standards and life expectancy to productivity and economic growth. Yet many fear that this time the change may be so fast and so vast, and its impact so uneven and disruptive, that it may threaten not only individual livelihoods but the stability of society itself. This outcome is not inevitable. The future is in our hands. Indeed, deliberate, coordinated action is exactly what smoothed the way for such transitions in the past. If we want the advance of technology to benefit everyone, however, we need to take action right away. We must proactively and thoughtfully reinvent the future of work. Simply understanding the problem is a challenge. Experts still disagree on exactly which groups and regions are losing jobs primarily to automation, how quickly such impacts will spread and what interventions might help. To build sound, long-term policy on something this important, we cannot rely on anecdotes. Government, foundation and corporate leaders need to invest in better data - today. 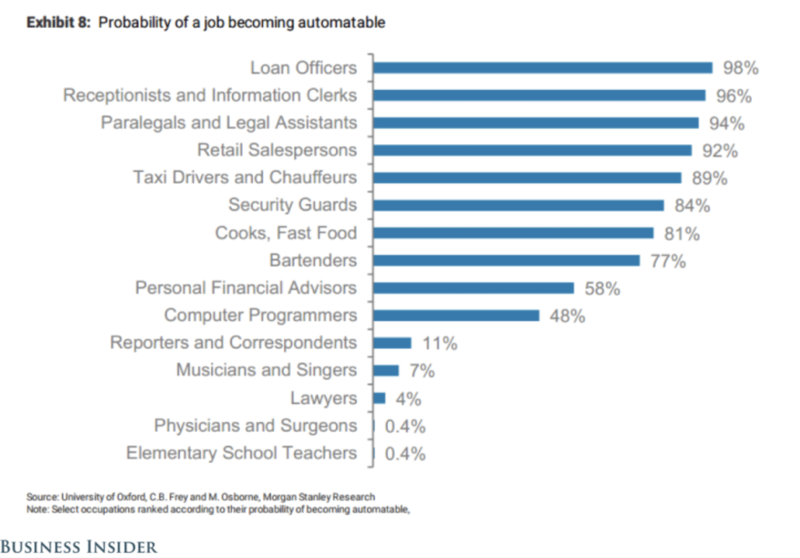 Which jobs are most immediately at risk of automation? In the meantime, we must act on what we do know and make progress wherever we can. For instance, CEOs across many sectors describe one painful current quandary. They have said to me, in effect: “I have to lay off hundreds of people because their jobs have disappeared and I do not need their skills – and I have hundreds of job openings I can’t fill because I can't find people with the right training and skills.” This mismatch is bad for everyone: Lives are derailed, families and communities damaged, business opportunities lost. Technology itself offers one path to a solution. In fields from robotics and cybersecurity to supply chain management, many universities, including MIT, are pioneering online programmes - such as MicroMasters - that provide top-quality, industry-relevant skills and credentials, in a form recognised by leading employers, and at a fraction of the price of traditional higher education. For people with industry expertise who need to become proficient in digital or problem-solving skills, including teachers seeking to prepare their students for the future, an answer could be ‘continuous uptraining’: a system that would allow every employee to devote significant time – every week, every month or every year – to acquiring fresh skills. If educational institutions, employers and employees can imagine and refine a solution together, continuous uptraining could become a crucial tool to help individuals adapt to relentless change. Reinventing the future of work needs to be a whole-society effort – and finding long-term solutions will require ideas and initiative from every quarter. Could educators, from kindergarten to college, make sure that every graduate, in every field, is computationally literate? Could institutions like MIT do better at helping students balance efficiency with other human values in choosing the problems they work on and in how they design solutions? Could workers help develop automating technologies that make humans more effective and efficient, instead of obsolete? Could corporations use some of the profits earned through automation to invest in developing those employees whose jobs have been erased by automation? Could unions help shape more relevant and accessible apprenticeship and uptraining programs? Could governments develop educational incentives that would motivate firms to locate in hard-hit regions? I believe the answer to all those questions can and should be yes – and I’m certain we need many more and better ideas, too. Automation will transform our work, our lives and our society. Whether the outcome is inclusive or exclusive, fair or laissez-faire, is up to us. Getting this right is among the most important and inspiring challenges of our time. It should be a priority for everyone who hopes to enjoy the benefits of a healthy and stable society; one that offers opportunity for all. In this work, those of us leading and benefiting from the technology revolution must help lead the way. This is not someone else’s problem; it is a call to action. Technologies embody the values of those who make them. It is up to those of us advancing new technologies to help ensure they do not end up damaging the society we intend them to serve. At MIT, we are deeply engaged in defining the current problem and forecasting challenges ahead. And we are urgently seeking allies, from across our society, who want to join in developing creative, collaborative solutions – and in building a future in which technology works for everyone.